Liza from AFW contacted GEOTEC Surveys Limited to discuss different geophysical survey techniques that would be most suitable for the purpose of finding voids beneath a reinforced concrete structure. The concrete structure related to the floor of an enclosed Service Reservoir in the North East as shown below. The request was made following the discovery of voiding and structural collapse within a nearby reservoir which led to water escape. We therefore worked with AFW to ascertain the thickness of the concrete floor, which was indicated at 300mm and the level of reinforcing, which comprised mesh in the top and bottom of the slab, approximately 100mm apart. The concrete was also thicker around the columns with denser reinforcement. In consideration of the limitations and site constraints and following an evaluation of other geophysical techniques that GEOTEC adopts, Ground Penetrating Radar (GPR) was deemed the most appropriate way forward. Given that the site was an enclosed reservoir, the main contractor, carrying out the maintenance works which included resealing of joints, managed the confined spaces entry element of the project as access into the reservoir was through a large service hatch / manhole cover. As such our surveyors had to be Confined Spaces Trained and due to the site being a clean water site, they also held EUSR National Water Hygiene. 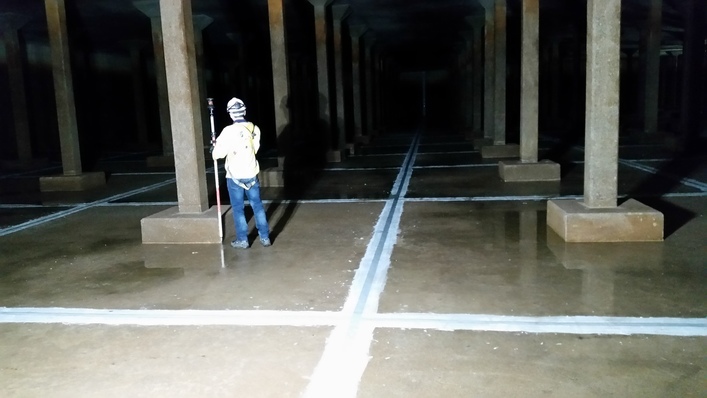 In addition the reservoir had to be drained and then cleaned on completion which meant that our site attendance also had to fit into the main contractor’s programme of works. As part of our discussions, we offered the client the option of aborting the survey should our surveyors feel that data quality was too poor to carry on once we had commenced, given the limitations and constraints that we could potentially encounter. This provided them with a level of comfort and peace of mind prior to any surveying taking place. In order to achieve our objective, we undertook the survey using 2x trolley-mounted Ground Penetrating Radar systems each fitted with a 400MHz Antenna, designed to search to a depth of approximately 2m below the ground surface. Our findings were then overlaid onto a topographical survey drawing produced by our surveyor’s onsite. The operatives were very professional in their duties and during an issue with a gas alarm they followed the correct evacuation procedure. Our instincts were correct and the geophysical data collected over the site was of a good quality. Although the reinforcing within the concrete did have an effect on some of the data collected, this was not considered sufficient enough to impact upon the processing of the results. During the data interpretation no anomalies were detected and the radar data was consistent with the already known features such as the upper and lower reinforcing within the flooring. The radar gram below indicates a sample of the scans taken from within the reservoir which shows the reinforcing within the floor and the consistency of the ground below. We concluded that there did not appear to be any areas of differing density or conductivity within and below the subsurface of the reservoir floor.